Severe arthritis pain can be managed without drugs. Arthritis is a serious condition which causes inflammation in the joints, leading to severe pain and loss of movement. While there is no known cure for Arthritis, there are ways that you can effectively manage your symptoms. In order to relieve your Arthritis symptoms, you need three very important things: improved blood flow circulation, deep tissue heating and compression. Better circulation means improved tissue health. Heating the soft tissue in the affected area will help relieve Arthritis pain. Compression works to reduce swelling and help support and protect the joint. 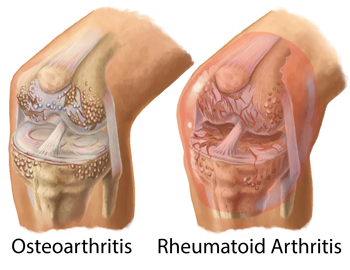 All three of these things together can help to relieve the symptoms of your Arthritis. King Brand® BFST® Wraps can provide the best treatment for your body, no matter where Arthritis affects it. King Brand® are the innovators of BFST® (Blood Flow Stimulation Therapy®). We developed this technology to accelerate the healing process of soft tissue injuries such as post-surgical wounds, tendonitis and torn muscles, ligaments and tendons. As it turns out, the same qualities which help heal soft tissue damage can also significantly reduce the pain and swelling of arthritis. BFST® Wraps have 3 key benefits which alleviate arthritis symptoms, which will in turn help improve your mobility. First, BFST® Wraps stimulate circulation. Blood and lymphatic fluid flow is one of the most critical elements for the treatment of severe arthritis pain. 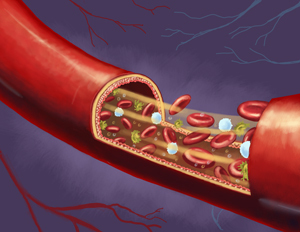 Blood flow is essential to tissue health, including cartilage. All the soft tissue that BFST® is designed to heal is a direct contributor to your joint health and arthritic condition. Healthy surrounding tissue and healthy cartilage result in less arthritic suffering. Second, a by-product of BFST® treatments is deep tissue heating which relaxes the muscles and tissue around your joint, further relieving arthritis pain. Most arthritis sufferers have already discovered the benefit of heat. With a King Brand® BFST® therapy device for arthritis, the heat is actually generated deep beneath the skin in the area around the joint. BFST® treatments far exceed the effectiveness of conventional heating pads. Finally, BFST® Wraps double as perfectly fitting compression bandages, and can be worn all day to support your joint and significantly reduce swelling, or keep it at bay. If your condition flares up, simply loosen the wrap, turn on the BFST® device for a blood flow stimulation treatment and you never let your condition take over. The BFST® Wrap promotes blood flow in the affected joint below the dermal (fat and skin) layer. Utilizing our proprietary Energy Web®, specially controlled Electro Magnetic Energy envelops your joint and stimulates blood flow deep beneath the skin. The resulting blood flow helps to relax muscles, which reduces pain caused by arthritis, and may also help increase mobility. To provide an even distribution of energy over the afflicted area, the Energy Web® is enclosed in a soft, comfortable neoprene wrap that molds around your joint, with attached Velcro® straps ensuring a customized fit. The wrap and unwrap design allows for easy application and after a treatment the device can be disconnected and the wrap further tightened, to provide snug support for the joint, allowing you to move about freely when not receiving treatment. The device is incredibly comfortable to wear. As FDA Registered Medical Devices, BFST® Wraps are completely safe and suitable for use in hospitals, therapeutic clinics and at home. Home use allows for pain relief whenever you need it. The areas of our body that are most frequently affected by Arthritis tend to be the hand, elbow, back/hip area and knee. We have a BFST® Wrap for each of these areas to help alleviate your symptoms and improve your mobility. If you have Knee Arthritis, the BFST® Knee Wrap is ideal for you. The Knee Wrap is custom designed to mold to the unique shape of the knee. It uses Blood Flow Stimulaton Therapy® to improve circulation in the affected area. It also provides deep tissue heating, which helps relax the muscles around your knee joint. BFST® treatments can help improve your mobility and relieve the pain and swelling of your Knee Arthritis. The wrap is also effective when used as a compression bandage, providing your knee with light support and protection. If you are experiencing pain, swelling and reduced elbow mobility brought on by Elbow Arthritis, BFST® (Blood Flow Stimulation Therapy®) treatments can help to control your symptoms and improve your range of motion. BFST® works by bringing additional blood flow to the affected area, which helps to treat the pain associated with your Elbow Arthritis. It also generates heat deep down in the soft tissue to alleviate your symptoms. Both of these things together can help to restore proper movement to your elbow. The BFST® Elbow Wrap does a great job of targeting the elbow area, which can be difficult to achieve because of the shape. If you have Arthritis in the hand or wrist area, our BFST® Wrist Wrap can help alleviate your symptoms. The BFST® Wrap provides the nutrient-rich, oxygenated blood flow you need to relieve the pain and swelling that comes with Arthritis. The wrap also provides compression and therapeutic heating, which can help to further relieve Arthritis symptoms. Combined, this leads to improved hand and wrist mobility. The design of the Wrist Wrap allows you to easily apply it anywhere on your hand or wrist for the treatments and target area you need. The BFST® Back/Hip Wrap is designed to be worn anywhere on the lower back, mid-back or hips. It molds comfortably to the body and has adjustable straps so you can customize the fit. The Back/Hip Wrap is guaranteed to fit anyone with a waist measuring between 22" and 54". If your waist measures above 54", we have Extension Straps that can be included with your order. The Back/Hip Wrap uses BFST® technology to bring extra blood flow to the affected area. This works to relieve the pain and swelling that comes with Arthritis. It also promotes deep tissue heating, which is another therapeutic benefit that will help your symptoms and improve your mobility. The purchase of every BFST® and ColdCure® Wrap comes with the free professional consulting services of our King Brand® Advisors. One of our Advisors will contact you 4-5 days after your order has been delivered to see how you're doing and answer any questions you may have. Our Advisors have been thoroughly trained on BFST® and ColdCure® technology and treatments. They are also knowledgeable when it comes to relieving the symptoms of Arthritis. Our Advisors truly want to help you feel better. They spend all day every day talking to customers just like you. While one of our Advisors will follow-up with you directly, you are welcome to contact us if you need any assistance. While some arthritic sufferers cannot support cold, many arthritis sufferers have found that their symptoms can be eased using cold compresses. If this solution helps your arthritis pain, then ColdCure® compression wraps are the ultimate treatment solution for you. 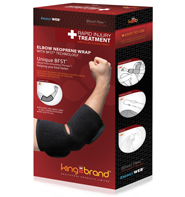 King Brand® has developed the ColdCure® line of compression wraps specifically designed for the treatment of pain and swelling of several conditions, including arthritis. These wraps contain several advancements in cryotherapy technology that provide the longest lasting cold therapy possible. The temperature is closely regulated so that the body tissue gets neither too cold to be damaged, nor gets warm too quickly to be ineffective. 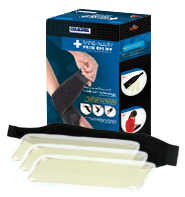 The rigid gel stays in place and allows for persistent cold compression immediately over the afflicted joint. ColdCure® Wraps are easy to use, safe, targeted and extremely effective. ColdCure® technology provides superior control of the swelling and pain without the negative aspects of drugs. You get the relief you demand and are still able to reduce pain as quickly as possible. Painkillers are the easy solution, but we all know they're not the best one. Painkillers (NSAIDs/analgesics) such as acetaminophen, ibuprofen and ASA are known to interfere with crucial, normal blood function and can prevent blood from clotting. Narcotics and steroids are not desirable options either, without medical supervision. The best possible natural solution for pain and swelling is clearly using ColdCure® technology. Cold compression wraps are standard medical products for the treatment of pain and inflammation, two common symptoms of arthritis. Cold and compression applied to an inflamed joint immediately reduces the risk of further damage caused by excessive swelling. This swelling is usually in the muscles surrounding the joint. Doctors and Therapists both agree that controlling swelling is a fundamental part of reducing long-term pain and possible damage as a result of arthritis. Reduction in swelling and inflammation can also help to improve range of motion. ColdCure® Wraps come with 3 swappable cold packs that contain our unique XC RigiGel® formula. This special gel formula won't move around inside the pack like gooey blue gel formulas. Our gel stays in place, even under heavy pressure for long periods of time. This means an even, consistent treatment every time. Our gel packs contain 3x more gel per lb than other products, for better coverage of the affected area. When stored in the freezer, our gel packs have 10x more cooling power than other products. This means faster relief of pain and swelling. It also means longer treatment times without having to swap the gel packs as often. The ColdCure® gel packs are inserted inside the soft, comfortable neoprene wrap one at a time. The gel packs are specifically designed for the shape of the joint. Every body part is uniquely shaped, which is why all of our gel packs are uniquely shaped too. Every one of our ColdCure® Wraps comes with gel packs that are custom designed for the body part. The ColdCure® gel pack molds comfortably to your joint to ensure that the entire affected area receives an even distribution of cooling power. The ColdCure® Wrap uses XC RigiGel® technology so that the gel does not flow away from the affected area when placed under pressure. Despite this necessary rigidness, the gel is still soft and molds to the body. ColdCure® Wraps are unique and of a higher quality and performance than any other wrap available. Nothing else comes even close. The wrap and unwrap design allows for easy application around the affected area. The areas of our body that are most frequently affected by Arthritis tend to be the hand, elbow, back/hip area and knee. We have a ColdCure® Wrap for each of these areas to help alleviate your symptoms and improve your mobility. If you have Knee Arthritis and find that cold therapy helps, the ColdCure® Knee Wrap may be what you're looking for. The Knee Wrap uses cold and compression to alleviate the symptoms of swelling and pain. This can also, in turn, help to improve knee movement. The Knee Wrap and gel packs are specifically designed to mold around the knee area. If you're storing the gel packs in the freezer, do your treatments in 20 minute intervals throughout the day, or for as long as you need the relief. 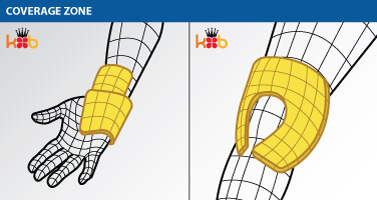 The Elbow ColdCure® Wrap is designed to alleviate the pain and inflammation that comes with Elbow Arthritis. When you purchase the Elbow Wrap, you get 3 swappable gel packs and a compression wrap to effectively relieve your pain and swelling. You use the gel packs one at a time, meaning you'll have one inside the wrap during treatment and the two others charging in the freezer. If you have Elbow Arthritis, the ColdCure® Elbow Wrap may be just what you need to relieve your arthritis symptoms and improve your mobility. 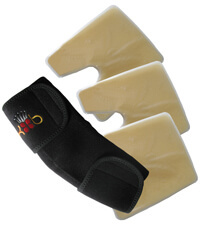 The ColdCure® Wrist Wrap is designed to be applied anywhere on the hand/wrist area to alleviate pain and inflammation. If you have arthritis in the hand or wrist and respond well to cold treatments, this is the ideal product for you. The Wrist Wrap uses cold gels and a compression bandage to deliver soothing cold to your hand/wrist. This works to bring down inflammation and control pain, which can help improve the overall movement of the hand/wrist. ColdCure® gel packs provide superior cooling power and coverage, for faster and more effective relief of symptoms. 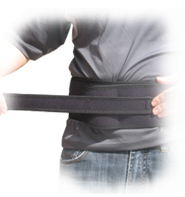 The ColdCure® Back/Hip Wrap may be just what you're looking for if you're suffering from Back/Hip Arthritis. The Back/Hip Wrap is guaranteed to fit anyone with a waist measuring between 22" and 54". If your waist measures above 54", we have Extension Straps that can be included with your order. The Back/Hip Wrap can be worn anywhere on your lower back, mid-back or hips. It provides you with both cold and compression, which works to relieve the pain and swelling that comes with arthritis, which in turn will improve your range of motion. Unsure about which product to use? Want to discuss your arthritis with a knowledgeable King Brand® Advisor? Call us toll free now at 1-844-400-2525. Our Advisors will help you pick the right products and can develop a treatment plan for you. We truly want to help you feel better. 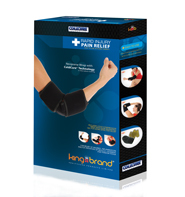 King Brand® medical products are the #1 choice by top Athletic Therapists and Medical Practitioners worldwide. We provide guaranteed results and customer satisfaction. Like all King Brand® products, there simply isn't a better-performing option. All King Brand® products come with a 100% satisfaction guarantee. Try our products and if you are not completely impressed, you can send them back for a full refund. We know you will love them though because thousands of people already use them and rave about the results. King Brand® BFST® and ColdCure® Wraps are FDA Registered medical devices. They have also passed the Health Canada, ISO 10993 and ISO 13485 approval processes. ISO 10993 is very important when it comes to material safety. This standard ensures that our medical devices are made from high quality, biocompatible materials. These devices are manufactured and tested to the highest safety standards in the industry. Note from KB WebMaster - The text below is primarily intended to assist with Google properly classifying this page content. To learn more about our products please visit our website.<br>Arthritis is inflammation in a joint. Arthritis is a disease with many causes. The most common areas to develop Arthritis are the Knee, Back/Hip, Elbow and Wrist/Hand. Arthritis is an incredibly common disease and condition that afflicts millions of people. There are different types of Arthritis, including Osteoarthritis, Rheumatoid Arthritis, Juvenile Arthritis and Post-Traumatic Arthritis. The pain of Arthritis is real. Arthritis results in a lot of pain and stops you from being active. To speed up treatment, you need to treat your Arthritis with BFST treatments. BFST treatments help your Arthritis pain reduce quickly. ColdCure treatments help relieve pain. Relieve Arthritis pain by using a coldcure wrap many times each day. Symptoms of Arthritis are lessened by coldcure treatments. Arthritis is painful. Arthritis can be treated. You can treat Arthritis quickly with the proper treatment. The afflicted joint needs to be treated quickly for pain to be relieved. BFST and ColdCure treatments are natural treatments that help you relieve yourself of pain. If you have Arthritis we have a treatment. Arthritis is the inflammation of muscles that surround a joint. Alleviate arthritis symptoms with BFST. Relax the muscles and tissue around your joint. Use BFST for blood flow stimulation for your arthritis. We have an arthritis symptom tracker discount. Manage your arthritis with BFST and ColdCure. Ease arthritis with cold compression.